Between LAN’s acquisition of GOL’s Brazilian rival TAM, currency worries and rising fuel costs, GOL faces stiff headwinds. Whether auto exec and new CEO Paul Kakinoff can turbo-charge a turnaround remains to be seen. GOL, the Latin American low-cost carrier, saw its losses widen in the second quarter and expects more of the same throughout the rest of the year. Although increased demand boosted revenue 16.9% to about $905 million in the second quarter, the Brazil-based carrier’s consolidated operating losses widened to around $175.2 million, from a loss of $133.8 million a year earlier. The airline pinned the lackluster performance on depreciation of the Brazilian Real against the dollar, rising fuel costs and increased landing fees. Tailwing of a GOL plane in Brasilia, Brazil. Photo by Leandro Ciuffo. And, GOL revised downward its 2012 outlook, stating that operating margin would be negative for the year, although the airline forecast that the second half of 2012 would be better than the first. The downbeat performance comes as GOL in July brought in a new CEO Paul Kakinoff, who was the CEO of Audi Brazil and had served on the GOL board. Kakinoff replaced Constantino de Olivera, Jr., who became chairman of the GOL board. Olivera had served as GOL’s CEO since 2004. GOL had announced the acquisition of smaller LCC Webjet in July 2011, although it still awaiting regulatory approval. 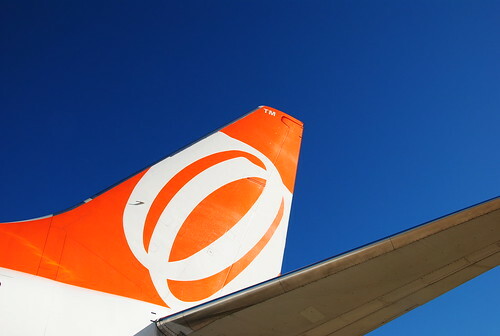 Airline consolidation in the region is in full swing as LAN Airlines recently completed its acquisition of Brazil carrier TAM. As GOL feels extreme margin pressure — second quarter operating margin was negative 19.4% — the airline and its prospective Webjet subsidiary have eliminated 130 daily flights, primarily night flights and longer routes. GOL has even served notice that it intends to cease flying to Santiago, Chile, in October because of the high costs of the service. And, despite the trims, GOL is looking for more profitable routes and has applied to fly between Brazil, Venezuela and the U.S. Excluding Webjet, which continues to operate separately, GOL flies around 840 flights, mostly in Brazil, but also to 13 other countries in South America and the Caribbean. It also flies under the Varig brand. Amidst GOL’s distress, one bright spot for the carrier during the second quarter was that its ancillary services revenue from rebooking, now show, cancellation, excess baggage fees and increased demand jumped 21.8% to about $112.4 million — about 12.5% of total net revenue.